The ancient Babylonians were the first to record sightings of Jupiter centuries ago. Jupiter is one of the five planets that is visible to the naked eye, so the ancients were able to spot it even before telescopes were invented. …Which makes sense, given its massive size! Naming a planet after the greatest of the gods makes sense, when it is the greatest of the planets. The Greeks knew Jupiter as Zeus, the god of thunder; similarly Germanic tribes knew it as Donar or Thor, also the thunder god. Only the sun, moon and Venus are brighter. You won’t be able to read your book by its light, but you can pick it out in the sky! You can see Jupiter with the naked eye, and even with a good pair of binoculars (check them here) you may be able to pick out some definition of the surface, and some of the moons. A good telescope for planet viewing (check here) really is the best way of viewing this giant, however. One turn of Jupiter’s axis lasts only 9 hours and 55 minutes. The fact that it turns so fast gives the planet a slightly flattened, oblate shape, as the poles are flattened and creates bulges at the equator. Its speed is somewhat surprising, given its massive size! The red spot certainly is great – it is so big that three Earths could fit inside it! It is now known that the spot is a massive storm, and that it has been raging for at least 350 years. Puts our hurricanes and tornados into perspective, doesn’t it? The spot appears to be shrinking, based on observations from Giovanni Cassini in 1665 which estimated its size to be around 40,000km. It is around half that size now, though it is expected that another storm will take its place if it does disappear completely. Ganymede is officially the largest, measuring larger than Mercury. Jupiter’s moons, also known as the Jovian satellites, also include Callisto, Io and Europa. Jupiter also boasts more moons than any other planet in the solar system, with 67 confirmed, and as many as 200 estimated. Almost all of these satellites are less than 10km in diameter, and were discovered relatively recently in 1975, when the spacecraft Pioneer 10 arrived at Jupiter. The core of the planet is ice, rock and metals, surrounded by layers of liquid metallic hydrogen and hydrogen gas. The expansive upper atmosphere is mainly comprised of hydrogen. Although nowhere near as impressive as Saturn’s, Jupiter’s rings are fairly enormous. The system begins around 92,000km above the cloud tops and stretches to more than 225,000km away from the planet. The rings are made mainly of dust particles from impacts by comets and asteroids and range from 2,000 to 12,500 km thick. Saying this doesn’t really explain the sheer size of this giant planet. 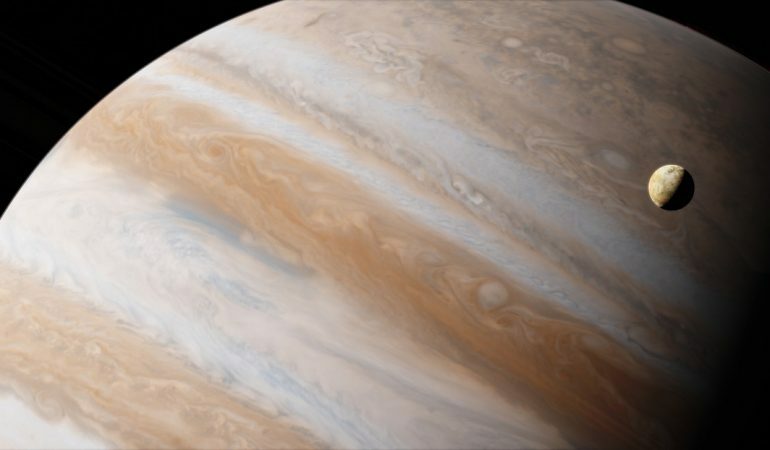 To put it into perspective, Jupiter is 318 times as big as the earth. If that doesn’t explain it enough, try this: Jupiter is 2.5 times bigger than all the other planets in to solar system combined! This field is 14 times stronger than that of Earth! Compasses would be incredibly accurate here – if you could survive the dangerous radiation that is also emitted from the planet and its moons! It would be very difficult to establish any kind of permanent outpost on any of the moons because of the radiation and the magnetosphere. The clouds whirling around over Jupiter are only about 50km thick, and are made up of ammonia crystals which are broken into two distinct cloud decks. The darker matter is thought to be compounds brought up from within the planet, which change colour when they react with sunlight. Just How Far Can You See With The Naked Eye?